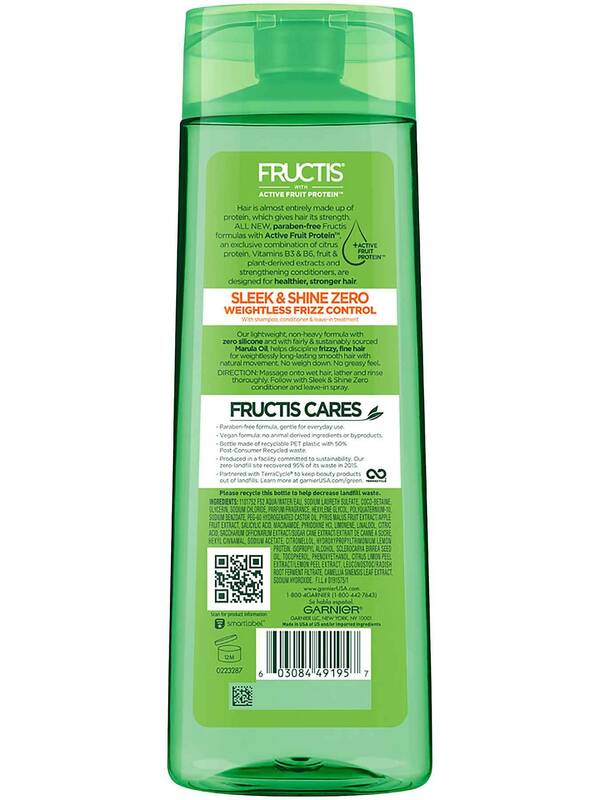 Lightweight, non-heavy Fructis Sleek & Shine Zero Shampoo with zero silicone and with fairly & sustainably sourced Marula Oil, helps discipline frizzy, fine hair for weightlessly long-lasting smooth hair with natural movement. No weigh down. No greasy feel. Massage onto wet hair, lather and rinse thoroughly. 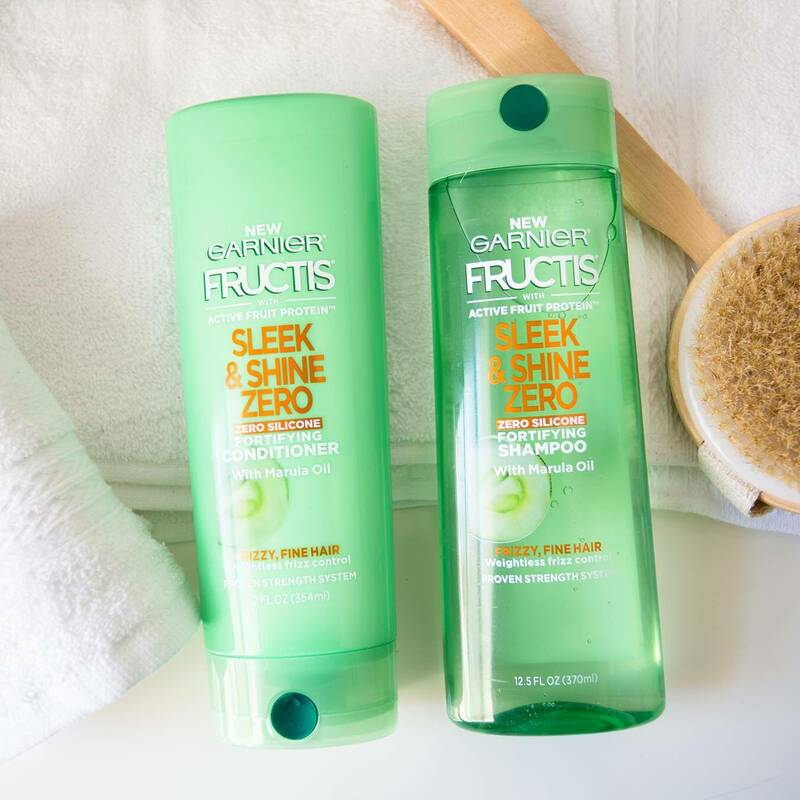 Follow with Sleek & Shine Zero conditioner and leave-in spray. Rated 5 out of 5 by Michele D from Great hair care product!! I bought Sleek & Shine Zero shampoo and I loved it!! I loved the smell and how soft and clean my hair felt after just one use!! Rated 5 out of 5 by Ren37 from Grand free sample I like this product and I will buy it again. I am recommending it to some of my friends. Rated 5 out of 5 by devidasi from Healthiest Hair Ever I received a sample of this product a few months ago and I'm so thankful because I feel like I've finally found my dream shampoo and conditioner! My hair is so much healthier now that I use this, and I've gotten more compliments on my hair than I ever have in my life. I have really long curly, frizzy, damaged hair and this product takes away the frizz completely! Also, the smell of this shampoo and conditioner is just amazing! Definitely the best smelling hair products I've ever used! Rated 5 out of 5 by MistyRose1978 from Great Shampoo n Conditioner I got my sample about a mth ago an I loved it so much I went an bought the full size. Thank you so very much for the opportunity to try both. It has worked miracles on my hair. I've told friends about it and family an got a few more ppl useing it. Thanks Sleek & Shine. 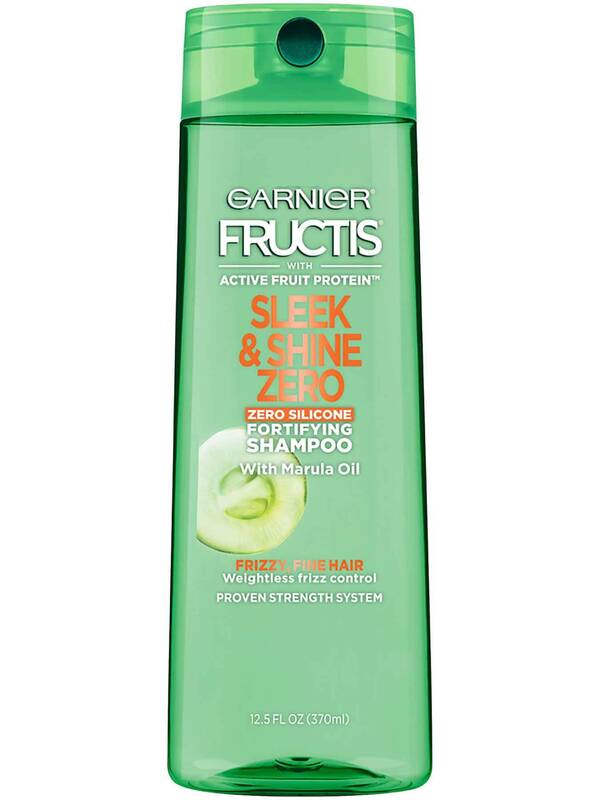 Rated 5 out of 5 by cece27 from ThaBomb Before I received Garnier Fructis my hair was very stringy, dry and hard to manage. I could never find a good enough shampoo. After using this shampoo, my hair has been smooth, less frizzy and more shiny! I absolutely love this shampoo and will be using it for as long as I can. Amazing. Rated 5 out of 5 by simbba from Great smell I loved the sample I received, good lather and great smell.